In an attempt to break into the eSports scene, gaming peripheral company Armaggeddon had recently hosted one of the biggest Dota 2 tournament in the region. 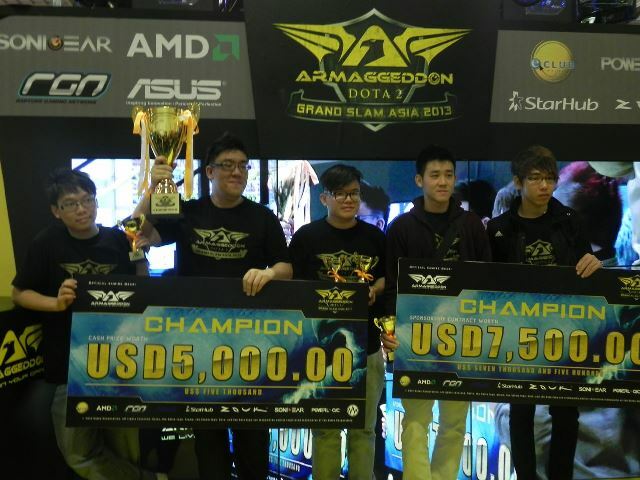 Dubbed as the Armaggeddon Grand Slam Asia 2013, it saw teams from all around the region competing for the top title and ultimately a sponsorship contract from the company itself. Malaysia's very own ABC, or for some particular reason which stands for Apple Banana Cucumber, were one of the clear favourites throughout the competition alongside Singapore's up-and-coming First Departure. Led by one of the more experienced Malaysian Dota 2 player and previous captain for Orange eSports, 'Winter' certainly played a critical role for the team's success throughout the tournament. They advanced through to the finals with a completely undefeated streak and was finally set up against First Departure again (after sending them down to the lower bracket previously in the tournament). ABC took the early lead in the first game, but loss focus in the second leading to a third and final determining round on who would take home the sponsorship contract. But once again ABC proved their dominance in the tournament and edged through, taking home the championship title with a 2 – 1 win.